The Gulf of Mexico oil spill is the worst environmental disaster the US has faced, a senior official has said. White House energy adviser Carol Browner also said the US was "prepared for the worst scenario" that the leak might not be stopped before August. BP is to try a new tactic after its latest failure to halt the leak, but says there is no guarantee of success. BP chief operating officer Doug Suttles said even if it worked it would only halt a majority of the spill. At least 20 million gallons have now spilled into the Gulf of Mexico, affecting more than 70 miles (110km) of Louisiana's coastline. Eleven rig workers died when the Deepwater Horizon exploded and sank nearly six weeks ago. Ms Browner, talking on NBC's Meet The Press, said: "More oil is leaking in the Gulf of Mexico than at any other time in our history. It means there is more oil than the Exxon Valdez (in Alaska in 1989)." She said she hoped the latest plan would work but admitted it would be a temporary measure and that a relief well currently being drilled might turn out to be the permanent solution. However, that will not be ready for at least two months. Ms Browner said BP had been told to drill another relief well in case the first did not work. In the meantime, BP is setting up its Lower Marine Riser Package (LMRP) to stem the flow. It will use undersea robots to slice through the damaged pipe to make a clean cut that can be connected to another pipe, capturing the leaking oil. The plan will take four days to set up. However, BP said the operation had never been carried out at a depth of 5,000ft and "the successful deployment of the containment system cannot be assured". The White House said the president had been informed that the flow rate could increase by as much as 20% until the containment device was applied over the leak. University of Alabama engineering professor Philip W Johnson told Associated Press news agency that although he was hopeful the plan would succeed, if the new cap could not be placed on the fresh cut, "things will get much worse". The system is similar to a previous containment dome plan that failed. Speaking on US television on Sunday, BP managing director Robert Dudley vowed the company would learn from its failed attempts and continue trying. He said the company would know by the end of the week if the latest attempt had succeeded. Mr Suttles earlier admitted its "top kill" operation to blast waste material and heavy mud into the ruptured well had failed. "We have been unable to overcome the flow from the well, so we now believe it's time to move on to the next of our options," he said. Mr Suttles said he "did not know for certain" why it had failed. Meanwhile at least 12,000 barrels (504,000 gallons) are leaking into the Gulf every day. BP has spent more than $940m (£645m) so far in trying to contain the disaster. President Obama earlier expressed anger at the latest failure. "It is as enraging as it is heartbreaking, and we will not relent until this leak is contained, until the waters and shores are cleaned up, and until the people unjustly victimised by this man-made disaster are made whole," he said. 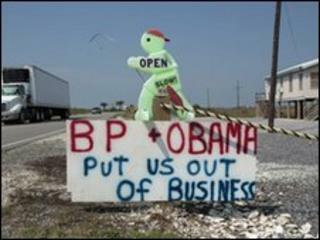 Mr Obama toured the oil-hit areas on Friday and said he would triple the manpower to contain and clean up the spill.